Naming this recipe was a challenge for me. I came up with Three Wishes Cookies, Mollycoddles, M'oreos, and the predictable Brownie Sandwiches, but none of them sounded right. Since I was bringing these to work, I asked my coworkers for their ideas. They rose to the challenge and came up with "Cocoa Sliders". 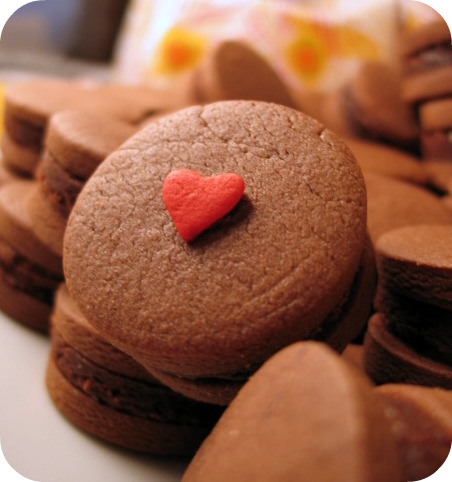 Considering how much these little cuties resemble little chocolate hamburgers, it made perfect sense. I made these cookies for my coworker Nicole to celebrate her birthday. I wanted to make her something super special because she's one of my blog's biggest fans. She gave me free-range to make what ever I wanted as long as it involved chocolate and didn't have nuts. I think these fit the bill perfectly. As for where I got this idea? Well, I knew Nicole was a cookie lover and I liked the idea of making a sandwich cookie of some sort. I was going to make brownie sandwiches with ganache in the middle but that didn't seem unique enough. Then I saw an Oreo commercial and that's when I had the idea to use the brownie as the filling and this cookie was born. See, commercials are good for something! Yield: 48 cookies. 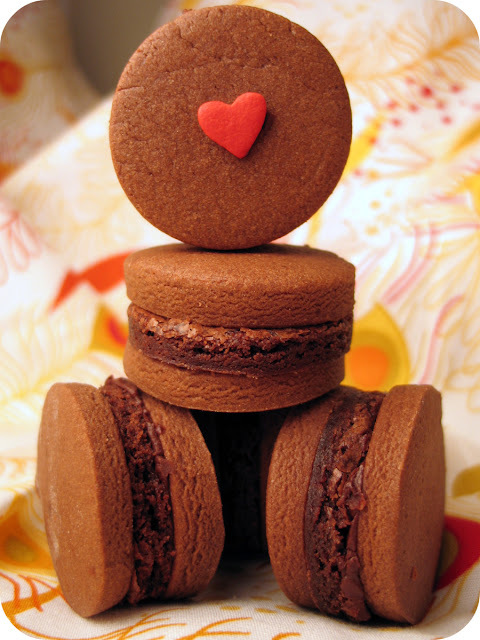 You could make these using a larger cookie cutter if you wanted, but the small one-inch size makes a great two bite cookie. 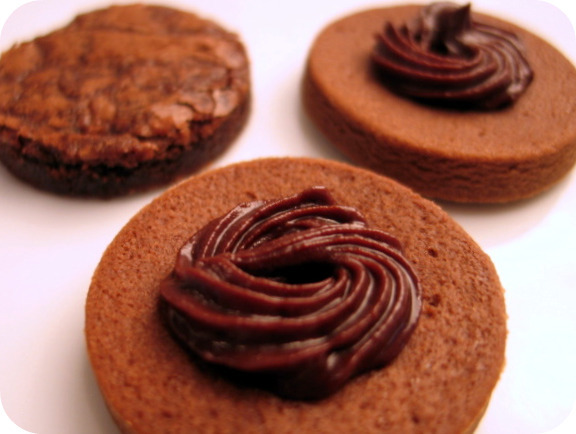 Start by making the cocoa shortbread cookies, as they take the longest from start to finish. Then make the brownies and the ganache last. To keep the cookies neat looking, put the ganache in a piping bag or a plastic sandwich bag with the corner snipped off, and pipe a small dollop of ganache in the center of every cookie. Top one of the cookies with a brownie, then add a cookie to the top. Push down firmly, being sure to spread the ganache evenly but not so much that it squirts out of the side. If that happens, use a clean, slightly damp, paper towel to remove any excess. Don't be afraid to lift off the shortbread to remove the excess if you need to. Beat the butter, sugar, and eggs for 1 minute, until well combined. 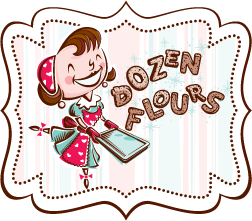 Add sifted flours to the mixture in three batches, mixing until you cannot see any flour in the dough. The mixture will be very thick and dry on the last batch. Divide the dough in half, knead each ball a bit (looking for pockets of flour), wrap in plastic wrap and refrigerate for and hour (or overnight). Lightly dust your counter with flour and roll the dough out to be a quarter inch thick (tip: I strongly recommend that you invest in a set of rolling pin bands. They slide easily onto the ends of your rolling pin and take all the guess work out of getting your dough a uniform height.) Cut 96 rounds using a 1 inch cookie cutter. 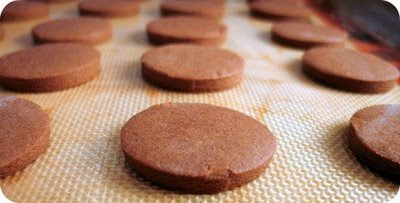 Place the cut rounds upside down onto parchment paper and store in the refrigerator until you're ready to bake them. The first batch should be refrigerated at least 20 minutes before you bake them. Place the rounds onto a parchment or Silpat lined baking sheet about an inch a part (they won't spread) and bake 10-11 minutes. Cool on wire racks. Preheat the oven to 350F. In a saucepan melt the butter and chocolate over low heat. Remove from the pan from the heat and let cool for 5 minutes. Stir in the eggs, sugar, and vanilla and mix lightly with a wooden spoon, just until it's combined. Add the flour and mix only until it's combined (try not to over stir). The batter will be lumpy and that's perfectly okay. Spread the batter in the pan(s). It will be very sticky and you'll need to use a spatula to get it to spread evenly to the corners of the pan. Bake about 20-25 minutes (15 minutes or so if you're making this in two pans...keep an eye on it and be sure not to let it over bake). Remove from the oven and let the pan(s) cool on the rack for at least an hour. 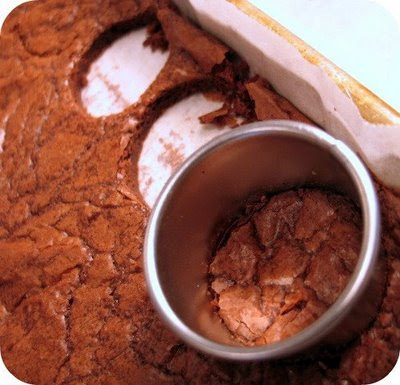 Leave the brownies in the pan, and using the same 1-inch circle cookie cutter, cut 48 brownie rounds and store in an airtight container in the refrigerator until you're ready to assemble. Heat the cream in a small sauce pan just until it's about to boil. Remove the pan from the heat and add the chocolate. Stir until smooth and let cool on the counter. Have I told you lately how AMAZING you are?! If it wasn't for being on a dieting/ health kick roll, and losing 4 lbs this week, I'd be making these babies tonight! Where did you get this idea?!?! Mmmmmm... Excuse me while I drift off to chocolate heaven! So creative!! Glad I found your blog!! Now...how much sugar in the brownies? Yum! I want these! The one with the little heart is adorable! Amazing pics! Coming from a girl who can never get enough chocolate, let me tell you that this creation is a dream come true! I cannot wait to introduce my friends to this one!! LOVE IT! These look incredible! What a thoughtful friend you are. Thanks for sharing, I can't wait to try them out. These look fantastic and have made me instantly fat, which is a measure of greatness in a recipe, obviously. I have a trick for rolling things to a uniform height that doesn't require buying extra equipment, though - roll it out inside a large freezer bag! Just cram all the dough in there, don't close it (air needs to get out), and go to town with the rolling pin. You are such a wonderful friend & co-worker!!! I can't wait until my birthday (7-13) to see what you virtually bake up for me! ps, sorry I haven't written. Last week was crazy & I worked myself into a sinus infection. I've been sick w/ a fever since Fri. evening. You are so creative! These are fantastic! oh these look delicious - i'm going to attempt to make them. I love to bake! Really creative! I love the idea of the brownie as the filling. I also love the little hearts on top - where did you find them? Thank you Diva, FinsMom, Sara, Elyse, Hayley, Camille (thanks for the tip! ), Ingrid (you're my biggest fan that I haven't met in person, silly! Hope you feel better soon! ), Stacey, Bunny, Remembering Moments, and Sara! I really appreciate all your comments! Wilton has them too but they look a little thiner than the ones I used. This is way too cute! How creative :) I really must give this a try. Too cute! I love the sliders! now those came out perfect! There cookies look just perfect - well done!